Many times I have attempted to re-read the entire original Marvel Star Wars run. I find it very easy to work my way through the first 88 issues. There are the occasional bad stories in that run, but for the most part, those 88 issues still hold an almost magical hold on the kid in me. With issue #89, my enthusiasm begins to falter because this issue reminds me of what is ahead. While the post-Return of the Jedi issues #81 through 88 do not have a clear direction, the stories are still decent. It is the quirky, non-Star Wars story in issue #89, where I start to remember how awful these final issues are. When I read issue #90 and my resolve to finish the run begins anew. But then I see the first page of #94 and my resolve dissipates almost completely. Do I put myself through the torture of trying to finish reading the rest of the run? More often than not, I choose not to read all the remaining issues and skip ahead to those few issues I enjoy. There are some good, interesting concepts hidden in these final despised issues. The Nagai, led by Lumiya and working with the remnants of the Empire, are a promising new threat to our heroes and the fledgling Alliance of Free Planets. I even like that they are invading the galaxy to escape an even greater danger. Unfortunately, this threat, the Tof species, does not live up to the billing. 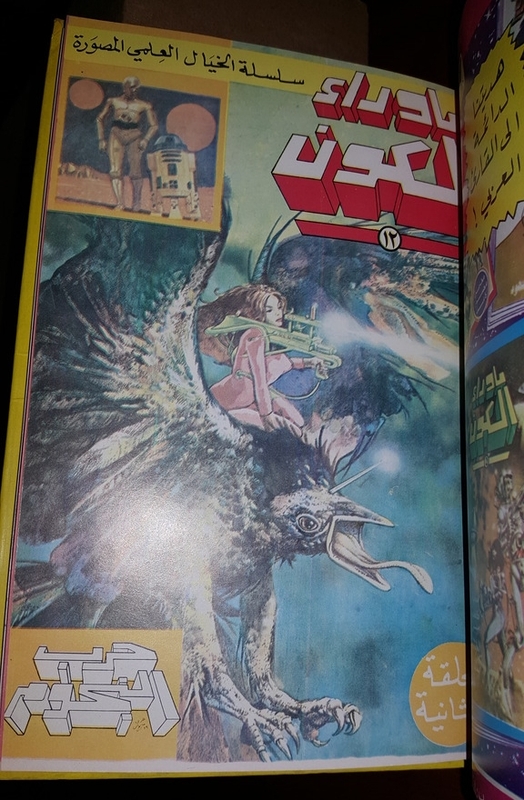 Han Solo's childhood friend Bey is also an interesting concept, neatly tied into the Nagai invasion and an earlier encounter Han and Chewbacca had with Knife, a Nagai, on Kasshyyyk. Unfortunately, these decent ideas are lost in a myriad of bad concepts, unfunny attempts at humor, and poor art by Cynthia Martin. The Hiromi, a cowardly insect species, are the worst of these offenses and it is hard to believe Jaxxon is the poster child for what is wrong with the original Marvel run. I think most people cite Jaxxon, because they read those early issues and did not read the final issues of this title. Unfortunately, the Hiromi are joined by the Zeltrons and Tof. 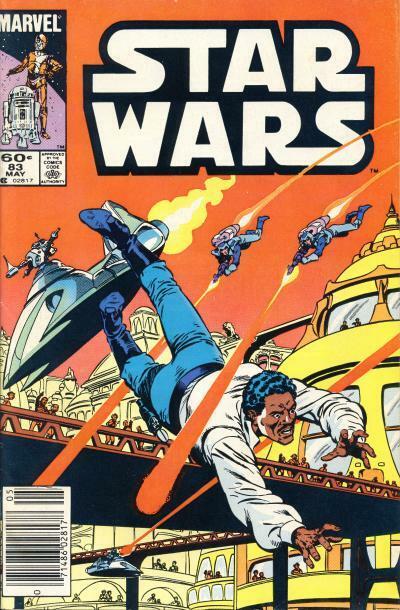 Star Wars #107 is hands down the worst Star Wars issue in Marvel's original run. It is clear Marvel did not give the writer, Mary Jo Duffy, much time to wrap up the already poor threads that were started in earlier issues, so this final is a messy conclusion to many story lines that should never have been initiated in the first place. This rushed ending sees Luke Skywalker dressed as Rambo leading a final assault on the Tof, who are now joined by Lumiya. Out of the blue, Dani is working with the Nagai Den Siva who tortured her and who she believes killed her lover Kiro. Bey, a traitor the last time we saw him, is now a spy working for the Alliance and conveniently saves the day. Han and Princess Leia are relegated to background characters in this ending. This final issue is valuable only because of its relative scarcity compared to Marvel's earlier Star Wars issues. In reality, the comic is not hard to find and this title was not ended because of low sales, but because of Marvel's 25th anniversary launch of The New Universe. No doubt, this final issue did have low sales compared to the first 80 issues or so. But those lower sales are completely warranted when you read this comic. 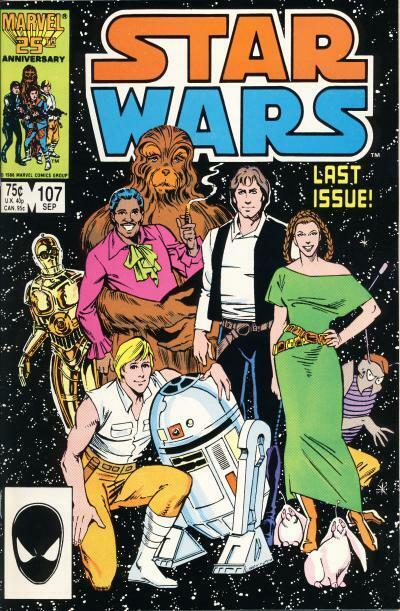 It is clear Lucasfilm was not invested in continuing the Star Wars saga when this comic was conceived and published. 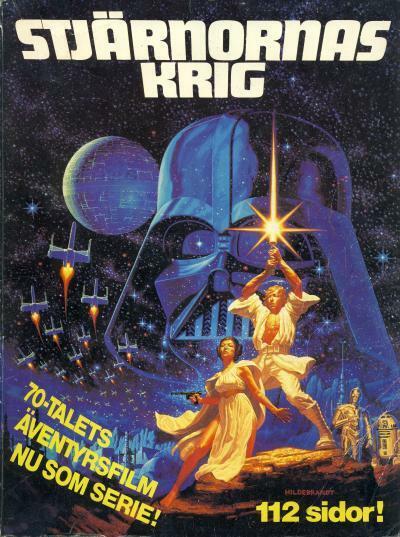 The Nordic countries of Denmark, Finland, Norway, and Sweden all had Marvel Star Wars comics translated into their native language between 1977 and 1983 in album or trade paperback format. Albums #1, 4, and 6 contain the Marvel movie adaptations. Albums #2, 3, and 5 contain other early Marvel stories arcs heavily edited. In Sweden, these albums were published using the Swedish name for Star Wars, Stjärnornas Krig. Album #1 contains Star Wars #1 - 6. The art used for the cover for this album is from the Hildebrant Brothers which is based on the Tom Jung original Star Wars poster. It make sense that the Hildebrant Brothers artwork is used on many comics and not Tom Jung's art; the direction for this version of the art was to make it "comic bookish". I want to correct a mistake a made a few weeks back. A reader, thinkdoug, had asked me about this particular comic and what I felt it was worth. At the time, I told him the interior contained Star Wars Annual #1. Since writing that response, I have checked my copy and I was wrong. 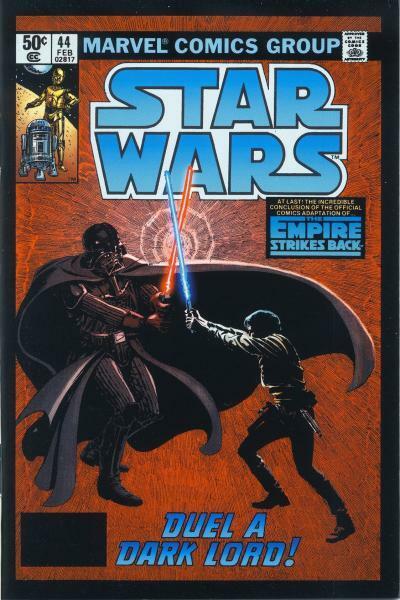 The interior of this comic contains Star Wars #1 - 6. Czechoslovakia was a Soviet bloc country from 1948 until 1990 when the Communist government was deposed in the peaceful Velvet Revolution. in 1993, Czechoslovakia became the independent states of the Czech Republic and Slovakia. 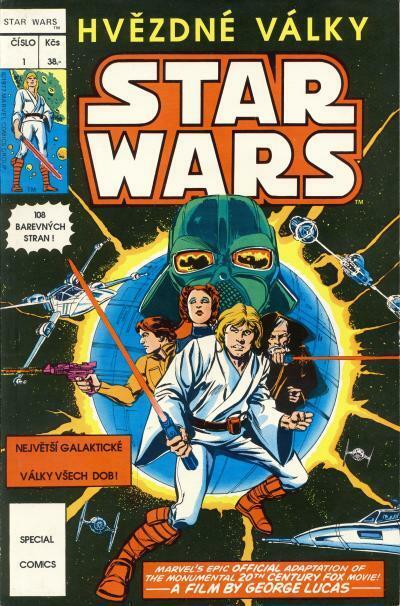 The Star Wars or Hvězdné Války Special Comics Trade Paperback was published in 1992 during a year when Czechoslovakia was preparing for the split. 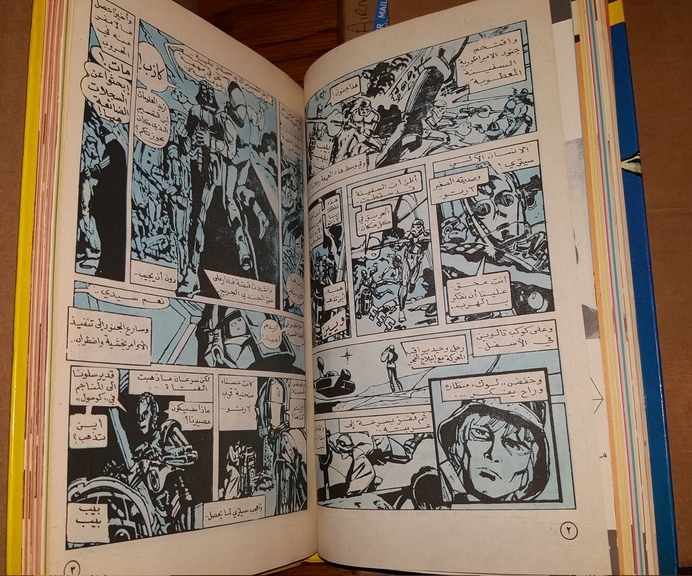 The interior is printed in full color on paper stock that is equivalent to the original Marvel issues. The comic is 108 pages and bound like a trade paperback. 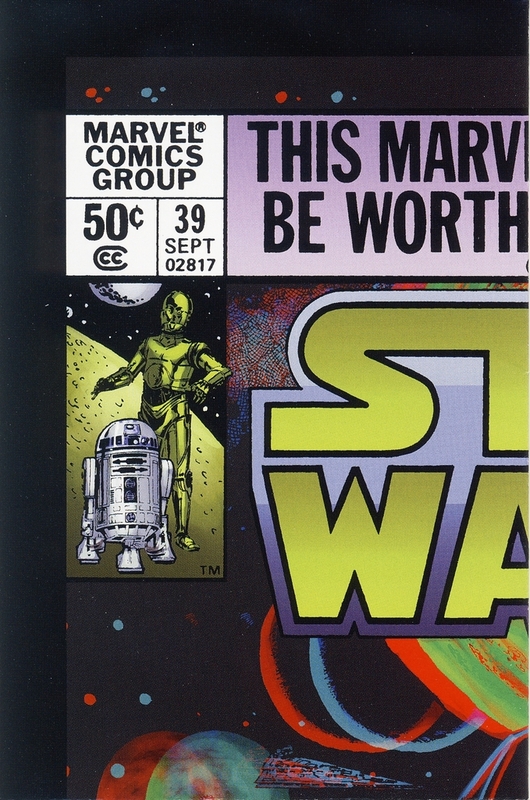 The cover is the same as that used on Marvel's Star Wars #1 including the colors, but some of the text is replaced with Czech. (The interior text is translated to Czech.) 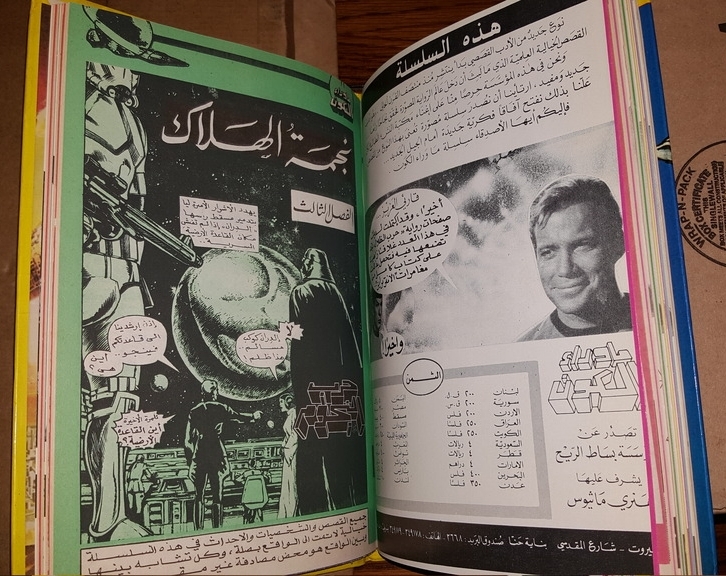 In fact, the character box shows the 1977 Marvel Comics Group copyright and the back cover shows information about Marvel Comics. Despite this, it was published by AGcomics and is almost certainly a bootleg comic. 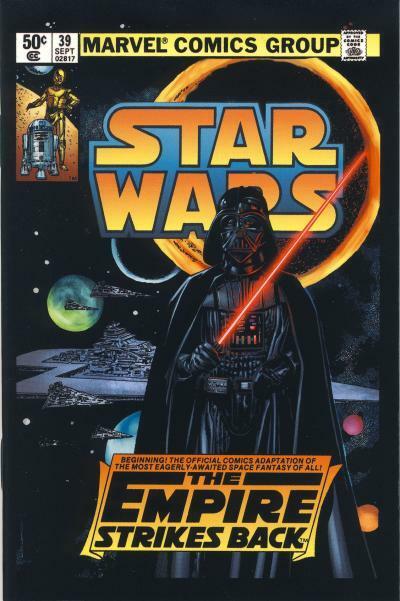 At the time this was published, Dark Horse Comics had the Star Wars license in the United States. This comic is not particularly rare, but in high grade I can see a copy fetching $30 or more from the right buyer. Flash Gordon had a huge influence on Star Wars' origin. George Lucas had first planned to make a Flash Gordon film, before he settle on writing and directing his own science fantasy story. Flash Gordon is about a hero that duels with a sword and wields a laser gun while leading a rebellion against an evil Emperor, Ming the Merciless. Flash's universe is inhabited by princes and princesses and all manners of sentient aliens and ferocious creatures. There are space ships, floating cities, and futuristic palaces. 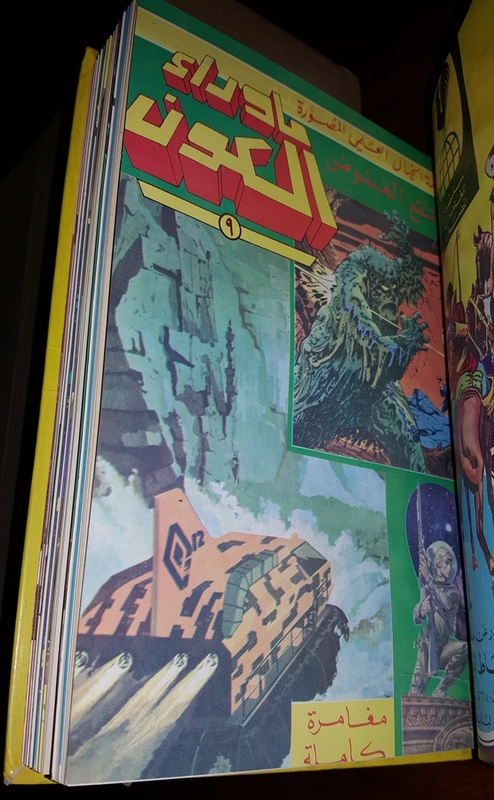 The story in Star Wars #83 pays homage to Flash Gordon. This solo Lando Calrissian tale, titled Sweetheart Contract, takes place on the planet Drogheda which is ruled by Queen Sarna and Harlech, commander of the royal guard. Lando's former girlfriend, Sarna, hires Lando to help her quell a revolution. Unknown to Sarna, her younger sister Danu is helping the insurgents, working class miners who want a democracy instead of a monarchy. As the story progresses, Harlech proves to be the stereotypical treacherous military leader and eventually, Lando concludes the insurgents are right and helps Danu and the revolution. In the end, Harlech is killed and Sarna is exiled by Danu. It is appropriate this Flash Gordon inspired story stars Lando Calrissian. Lando Calrissian has some of Prince Barin's personality and his blue cape could easily be worn by a character from the Flash Gordon strip. Additionally, his Cloud City looks like King Vultan's futuristic floating city. 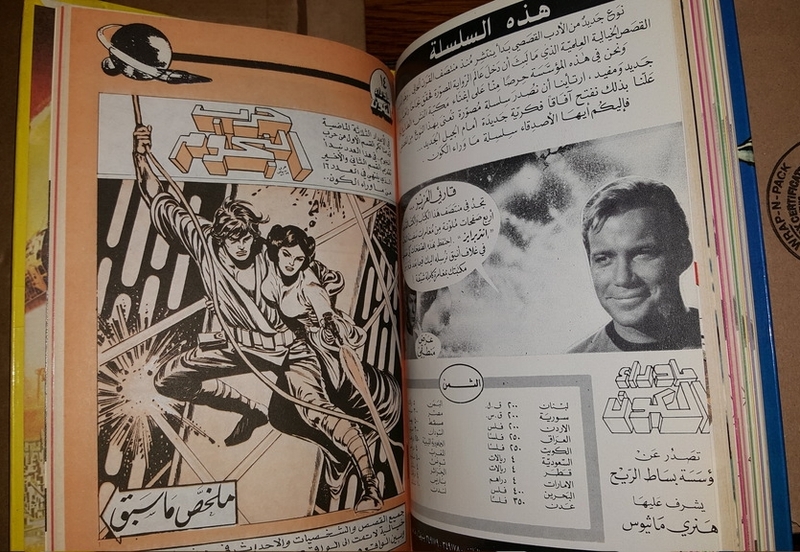 Many of the elements on the cover to Star Wars #83 can be traced back to the Flash Gordon comic strip. The obvious are the laser guns and the futuristic city. Additionally, Flash Gordon uses a sky-sled in the strip, although the vehicle Lando is jumping from looks more like the rocket cycle used in the 1980's Flash Gordon movie. 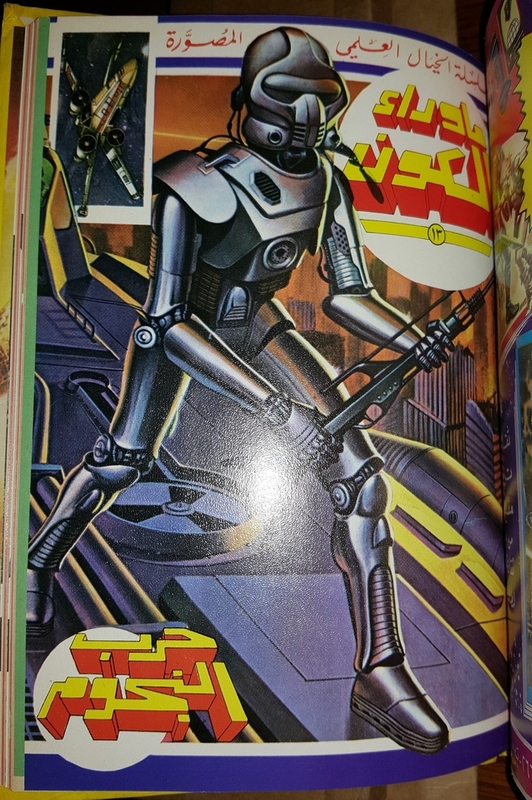 The jet packs worn by the attacking royal guard are more of a Buck Roger's trope; Flash Gordon itself was heavily inspired by the Buck Rogers comic strip. 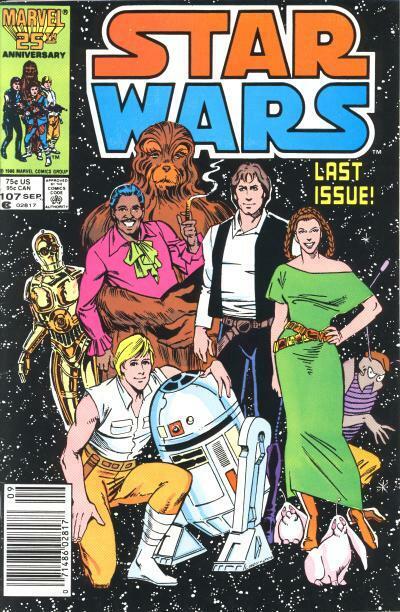 Semi-regular artist Cynthia Martin began penciling the interior art for Marvel's original Star Wars title with issue #94 and she would contribute art until the final issue. Her art style was awful for the Star Wars title. Luckily for those who stuck with the title through to the end, there were a few decent issues. One of those issues is Star Wars #98. 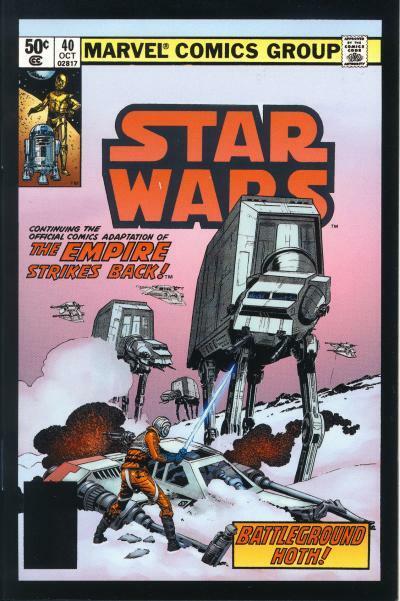 The classic team of writer Archie Goodwin and artist Al Williamson worked on the The Empire Strikes Back adaptation as well as many of the newspaper comic strips. 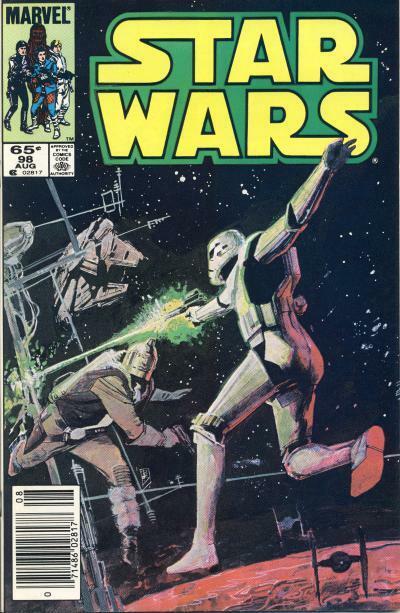 Archie Goodwin also wrote 37 of Marvel's Star Wars issues. The two teamed up again to work on Star Wars #98 in a story titled Supply and Demand. In the story, Han Solo is sent on a mission to the planet Vandelhelm to secure materials needed by the Alliance for building starships. Han Solo's co-pilot is Nien Numb, Lando's co-pilot on the Millennium Falcon during the attack on the second Death Star. Han's mission is to pick up two kids, a teenage girl and a young boy called the "Venerated Ones", from an ex-Imperial prison planet and transport them to Vandelhelm. Vandelhelm's mining operations is run by a guild of superstitious metal smiths who take their direction from these kids, original descendants of the two families who discovered the planet. The kids were held prisoner by the Imperials to force the guild, led by guildmaster Orrk, to produce supplies for the Empire with the Imperial oversight led by Admiral Mordur. Since the fall of the Empire, guildmaster Orrk has allied with Admiral Orrk to maintain control of the guild and he is not keen on seeing the kids return to resume control. In the end, Han, with help from Nien Numb and Lando Calrissian, successfully completes the mission. Interestingly, despite a significant presence in the comic, Nien Numb is never shown speaking, although Han responds to him several times as if he is talking! 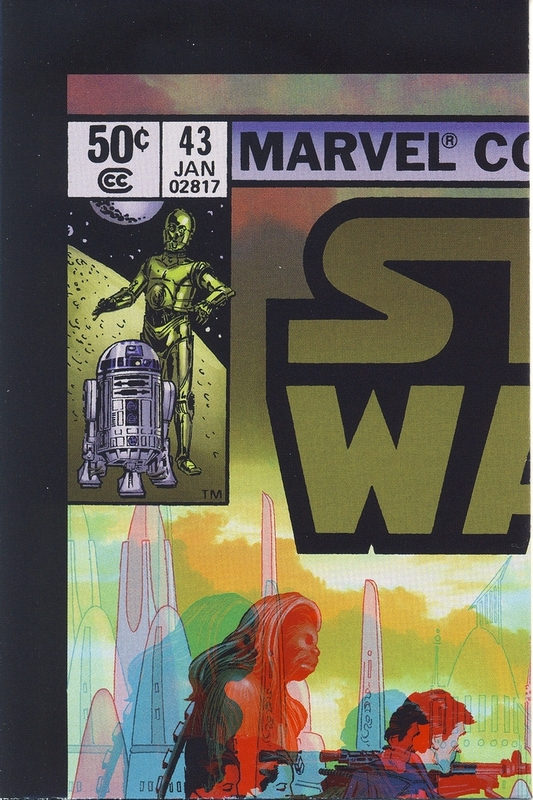 The cover art to Star Wars #98 is by expressionist Bill Sienkiewicz. It does not represent the story inside the comic. Inside, there is a sequence where Han Solo is wearing a space suit and fights Imperials, but the spacesuit looks nothing like what he is wearing on the cover and his fight with Stormtroopers is in the cargo hold of a transport barge, not in space. To make matters worse, the space helmet makes it appear that Han has lost his head. Almost 10 years after the original story, Dark Horse reprinted Star Wars #98 in a one-shot titled Classic Star Wars: The Vandelhelm Mission. New cover art is provided for this reprint by the master artist Al Williamson himself. 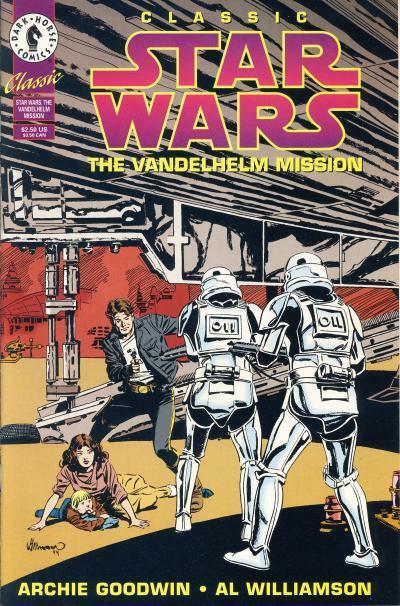 The cover is taken from a scene inside the comic where Han protects the two kids from a pair of Imperial Stormtroopers. Again, Nien Numb is slighted, since in the story, it is Nien Numb who shoots the Stormtrooper pair while Han is covering the kids on the ground. There is no contest on which cover is better. 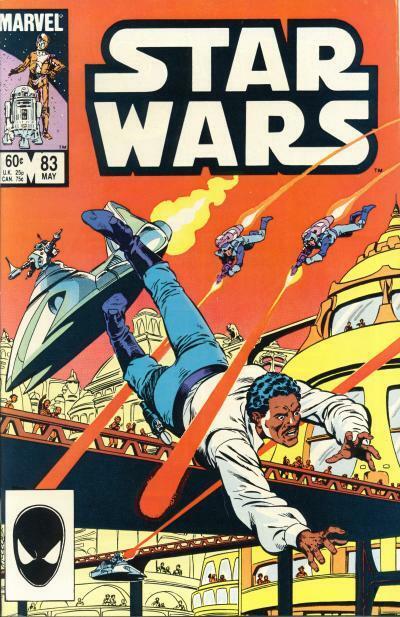 Star Wars #98 must have been drawn with little knowledge of the actual content of the story inside the comic. Getting Al Williamson to draw the cover to The Vandelhelm Mission was a coup for Dark Horse and it is unfortunate Williamson did not get to provide his exquisite craft to the original cover. In May 2016, IDW released their second Star Wars micro comic packs, this time for The Empire Strikes Back adaptation. 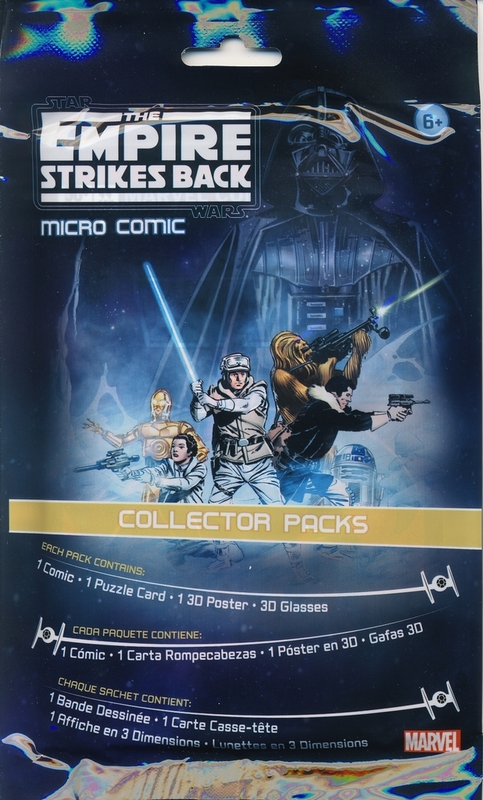 Each Star Wars: The Empire Strikes Back Micro Comic Collector Pack includes: 1 micro comic, 1 3D poster, 1 pair of 3D glasses, and 1 trading card. They retail for $3.99. These packs come 24 to a box and like the first set, it is easy to see the issue number through the logo on the pack if you want to get a complete comic set. 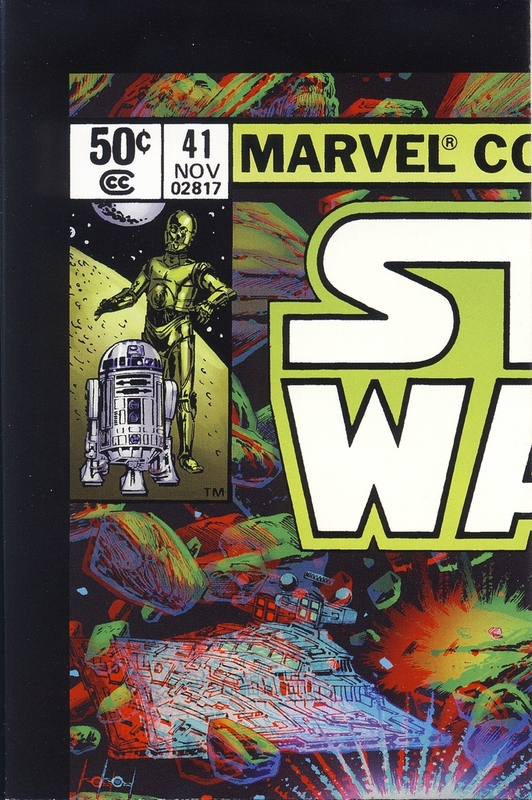 There are 6 different comics in these packs reprinting Marvel Star Wars #39 - 44. The cover and interior pages are based on the remastered (recolored) hardcover version of the movie adaptation that Marvel published in 2015. The cover stock is thick and glossy and the interior pages are printed on quality paper. 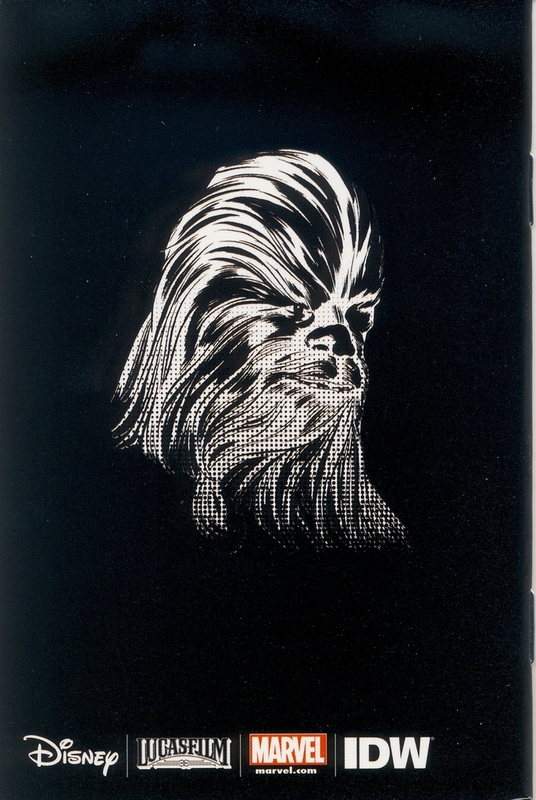 The back of the micro comics are mostly black with a drawing of Chewbacca's head taken from a panel on page 9 in Star Wars #43. At the bottom of the back are the logo's of the companies involved: Disney, Lucasfilm, Marvel, and IDW. There are 6 3D posters, each showing the cover of the micro comic inside the pack which can be viewed with the accompanying 3D glasses. The posters are folded in quarters to fit inside the pack. There are no changes to the quality of the trading cards inside these packs. Unfortunately, these trading cards do not live up to the high quality of the other items in a pack. There is an ad inside the issues for Return of the Jedi micro comics coming in July 2016. These micro comic packs have not shown up at Phoenix, Arizona retail stores like Target to my knowledge. I knew they started appearing last month elsewhere and I ended up buying 6 sealed packs online. I was very pleased with the first set of these micro comics and could not wait to get my hands on this set. I'm eagerly anticipating the Return of the Jedi set and wouldn't mind seeing IDW do this for other Star Wars comics. I am a month behind on the sales analysis of the Marvel Star Wars titles. This analysis is for April 2016 books. The Comics Chronicles released the April 2016 estimated sales. As expected, with two new #1s, sales bounced back from the lows seen the last few months. Both the Star Wars and Darth Vader titles set new lows. Star Wars had a larger than normal drop and moved less than 100,000 units in April for the first time. Darth Vader saw the normal month to month shedding that most comic books experience. It is remarkable both titles are still top 10 titles when you consider the onslaught of new superhero #1s the industry has seen the past few months. The Darth Vader title is ending with issue #25 and Marvel has not announced what title will be replacing it. Obi-Wan and Anakin #4 saw a standard fourth issue drop. The new ongoing Poe Dameron title debuted with 175,000+ units sold. This is a far better debut than Kanan, the title it is replacing, which only sold around 108,000 units its first month. The Force Awakens was a juggernaut at the theaters and with more Poe Dameron undoubtedly coming in future Star Wars movies, expect the Poe Dameron title to outperform Kanan. It is unlikely this title will be as strong as the Star Wars and Darth Vader ongoing have proven to be, but it should easily be a top 25 title for the foreseeable future. 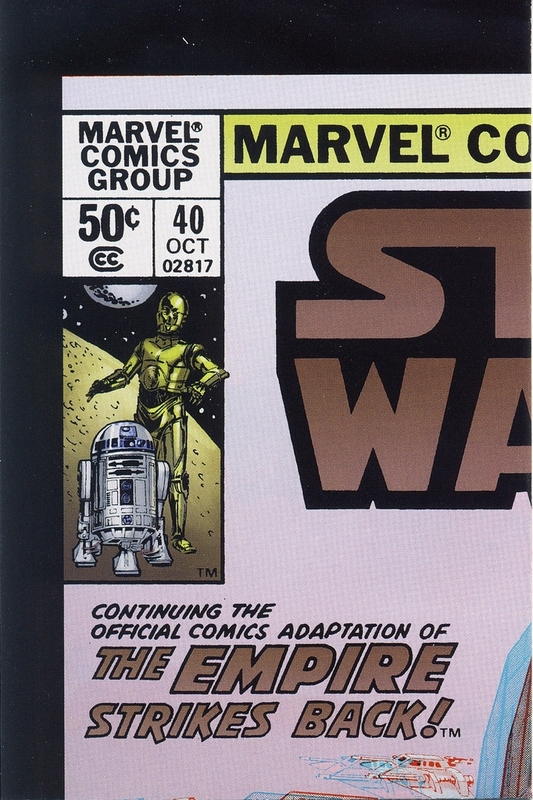 The much delayed Star Wars Special: C-3PO one-shot is the first original content one-shot from Marvel so there is nothing to compare it against. I have to believe with sales well over 100,000 copies and the title placing at 4th on the charts, Marvel has to be pleased with the results. We'll never know if Marvel had released this title on time closer to the movies run in theaters if it would have sold better or not. The average sale per issue would rank 5th on the top 300 chart for the month of April. With the two #1s, this month saw a nice increase in average sales per issue over the past few months. Star Wars trade paperbacks are selling well and reorders remain strong. Take a look at the Star Wars Sales Estimate Chart and please read the blog posting Black Panther #1 year's bestseller at 253k copies; major publishers offer 12% fewer comics in 2016. 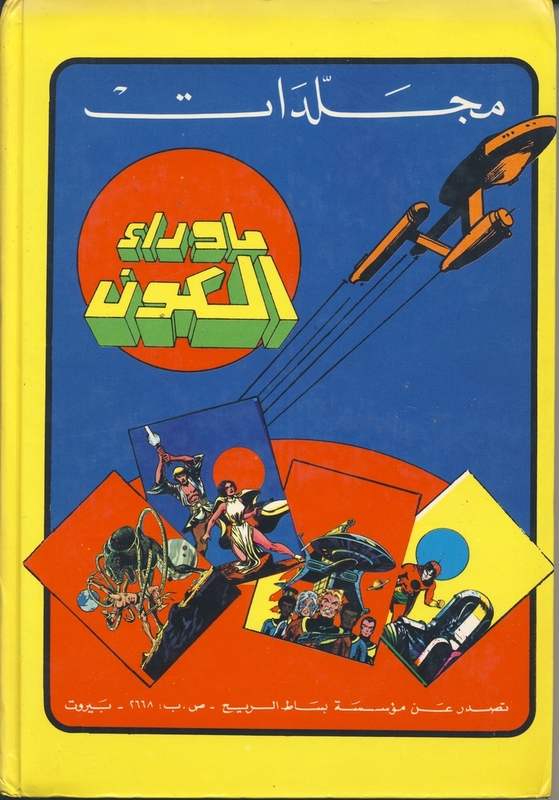 In 1979 the comic anthology Beyond the Universe was started by Lebanese publisher Bissat El-Reeh or Flying Carpet. Beyond the Universe ran for 140 issues. 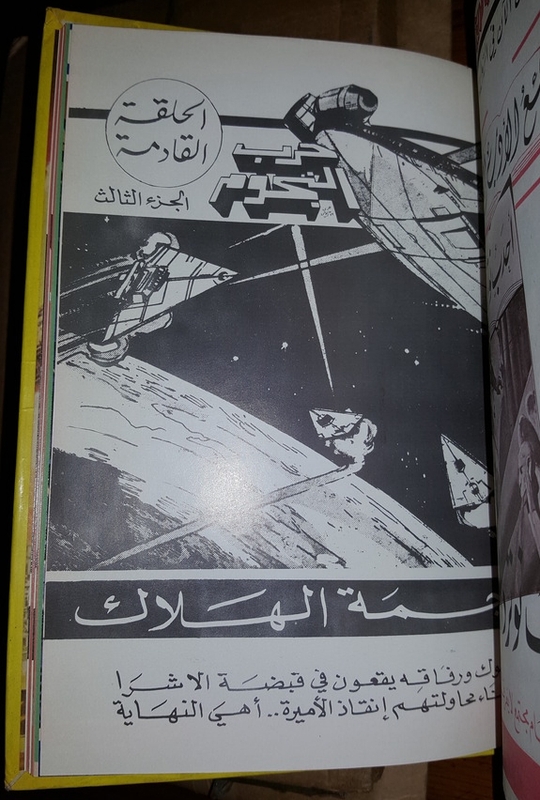 The series started off by translating science fiction themed western comics into Arabic. Marvel superhero comics soon joined the comics being translated but it was issue #29 that is the key issue of this series. In that issue, Grendizer, a Japanese anime series about a giant robot, made his debut in a story translate from French. This character was one of several characters introduced to the United States under the Shogun Warriors brand. Issues that contained Grendizer increased sales dramatically and issue #45 on starred Grendizer until the final issue published in 1983. 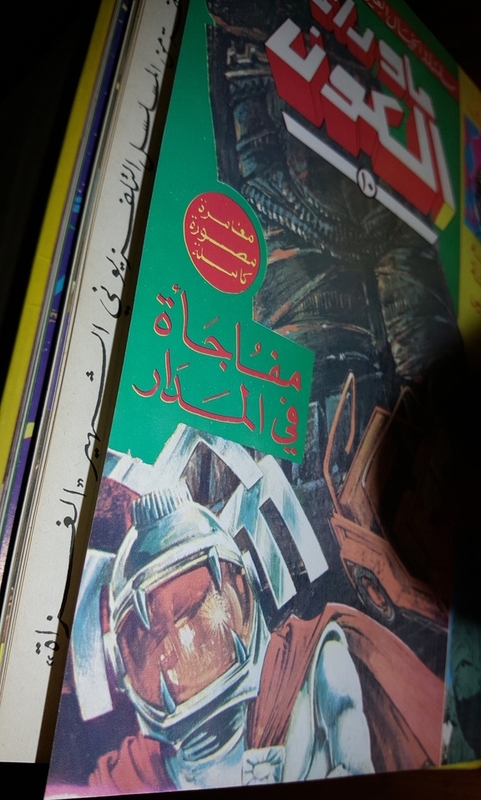 Grendizer was extremely popular throughout the Middle East. The series started bi-weekly, but became weekly over time. Early comics only included one color, but by issue #44 full-colored stories began. Most issues are 36 pages without ads. Each comic is collected in an album of 7 issues each, for a total of 20 albums. 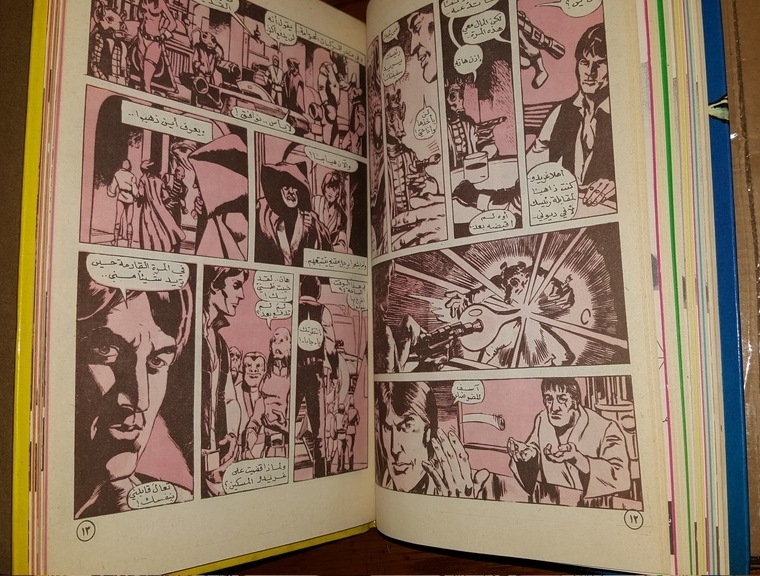 Binding single comics into a collection is a common practice in foreign countries; it is not know if the comics in these collections are remainders, returns, or newly printed comics. What is know is most of the issues that survived appear to be from these collections and single issues are extremely hard to track down. It is not uncommon for these issues to be pulled from these collections and sold as single comics. 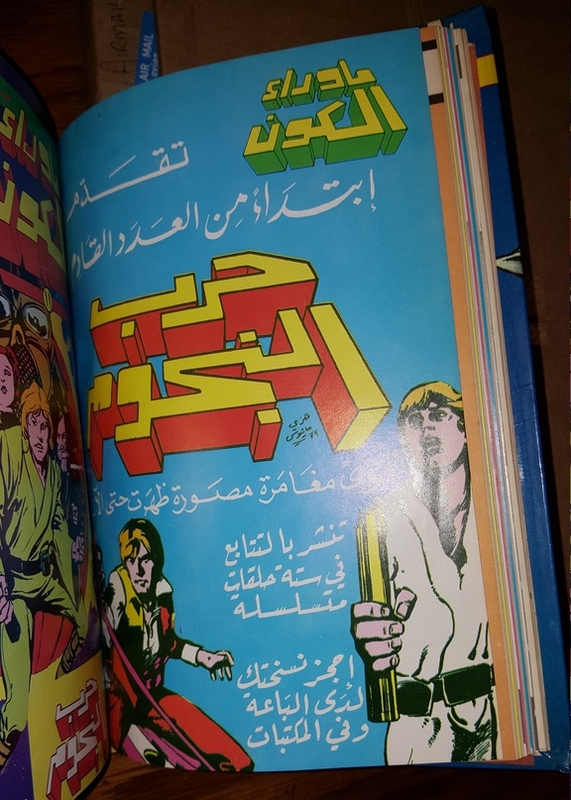 Remarkably, these comics were published in Lebanon in the middle of a 15 year civil war that began in 1975. 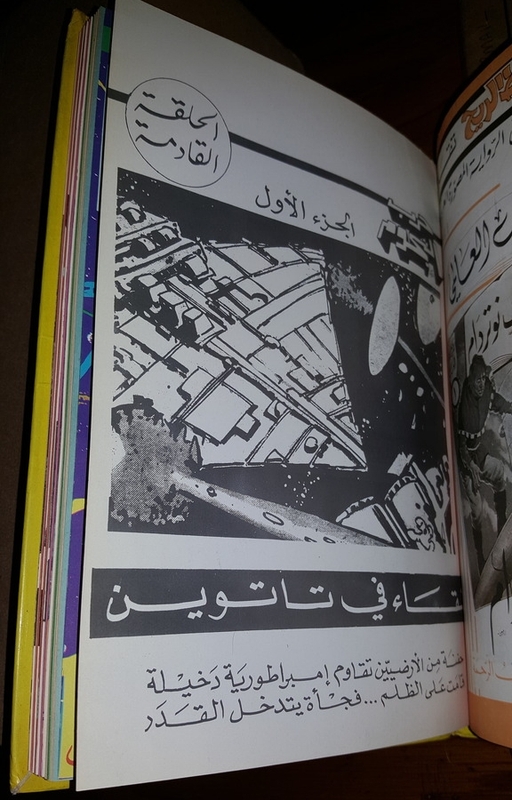 For Lebanese children who grew up during this era, the Grendizer cartoon and comics were a distraction from the atrocities that were taking place in their country. 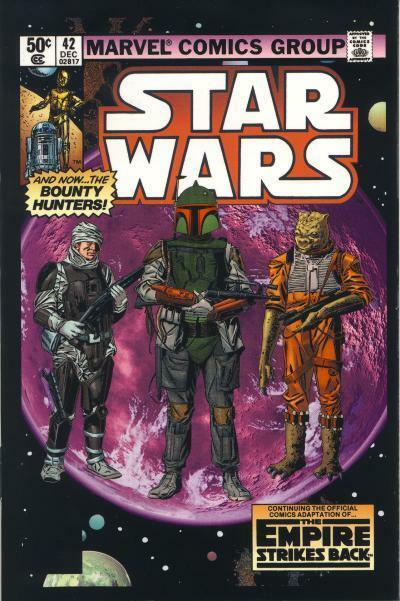 The Marvel adaptation of Star Wars was published in Beyond the Universe #11 - 16. 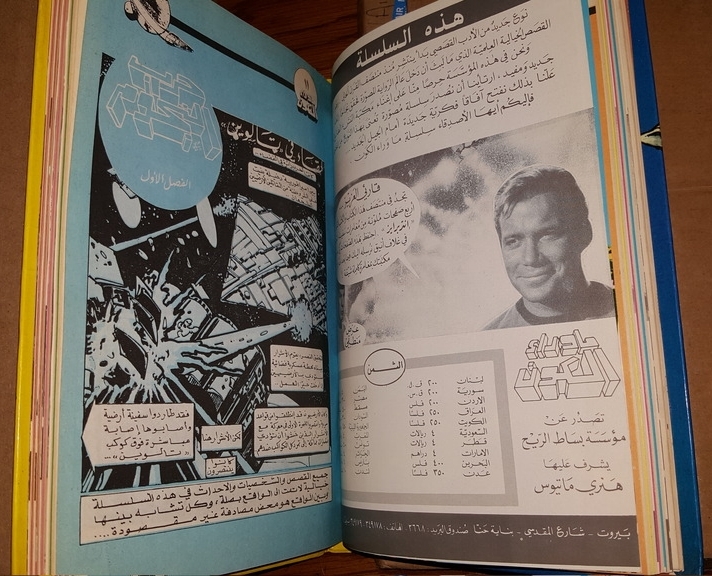 Beyond the Universe Album #2 contains issues #8 - 14, or the first four chapters of the adaptation translated into Arabic. In all 4 issues, Star Wars is the lead story. There are at least 2 different printings of several of the Beyond the Universe Albums. If you look at the back cover of this version, the covers shown are for the first 4 albums. There is another version of this album shown in the blog posting Beyond the Universe. The back cover for this presumably identical collection is different. It is hard to say which version was published first because the back cover shown on that collection shows Grendizer, a character that did not appear until issue #29. This is all speculation until these albums can be compared or I dig up additional information concerning these different printings. 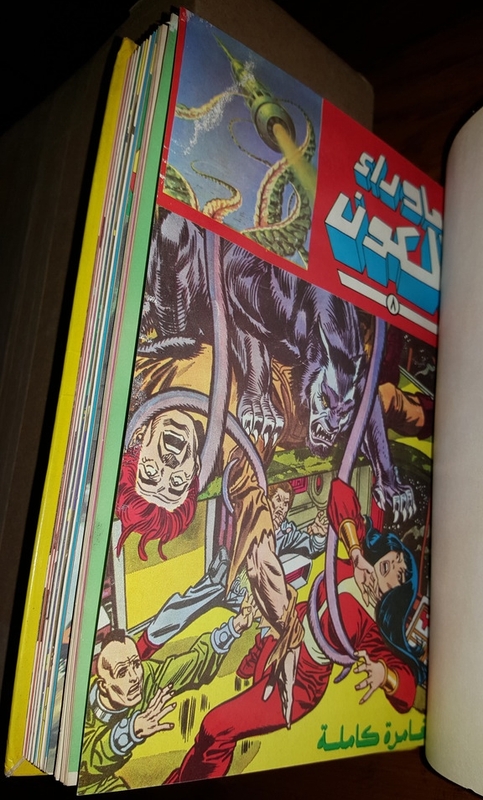 This collection contains 7 issues bound together with an outer hardcover as can be seen from the top. 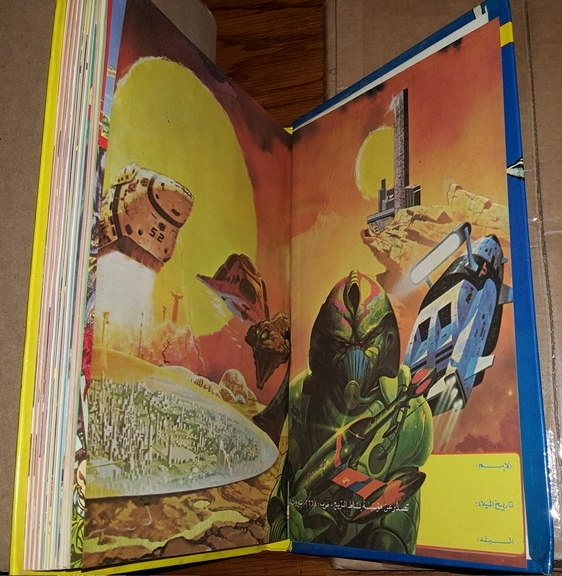 In addition to the outside hardcover, there are pages inside both the front and back covers containing science fiction art. both the back and front cover contain the same 2 pages. Bound issues #8 and 9 contain several science fiction stories and a full-color glossy centerfold. 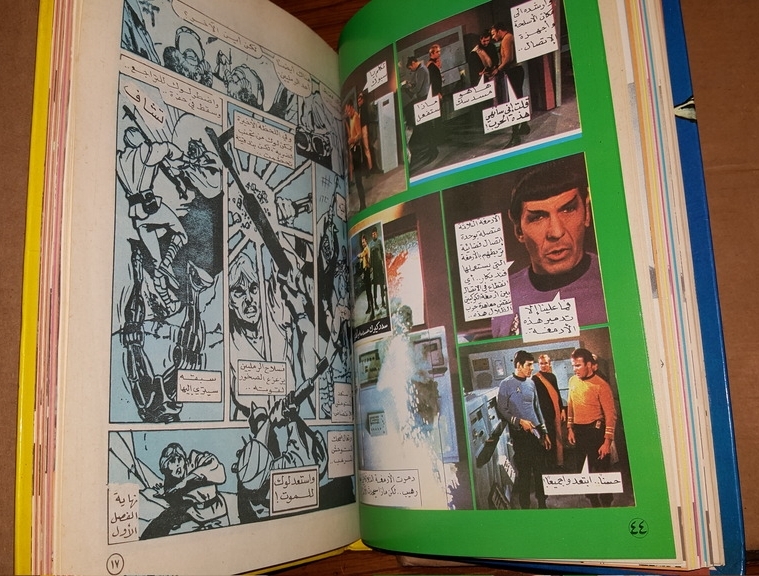 The centerfold is a 4 page Star Trek fumetti consisting of photos from the Star Trek TV series along with word balloons. All 7 issues in this collection contain a full-color glossy centerfold, most of which are Star Trek fumetti. Bound issue #10 contains a next issue page on the inside back cover that shows Star Wars is in issue #11. All 7 issues contain this next issue page. 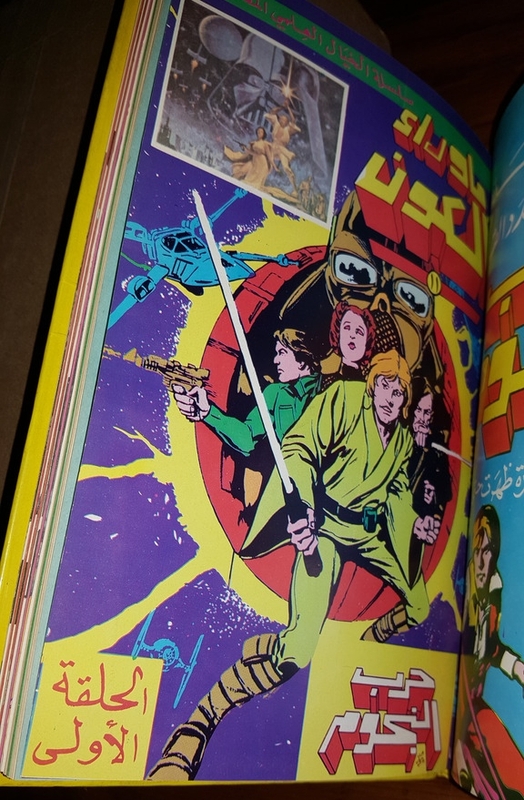 In addition to the next issue page showing Star Wars, the back cover also shows images from the Star Wars adaptation. 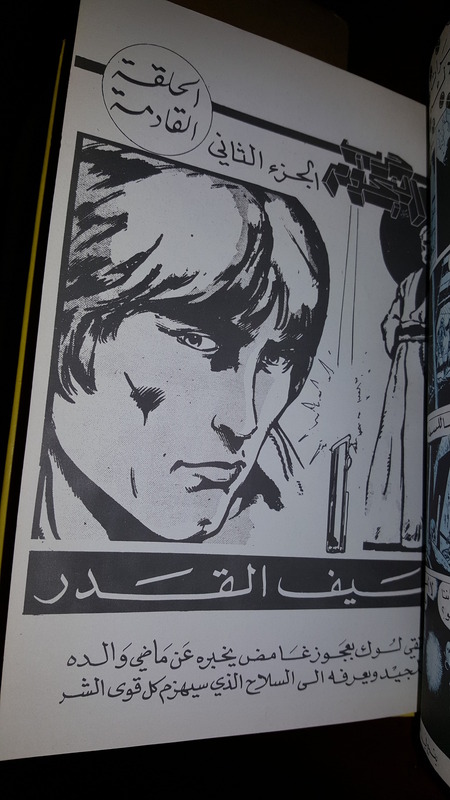 Bound issue #11 contains the Arabic translation of Star Wars #1. 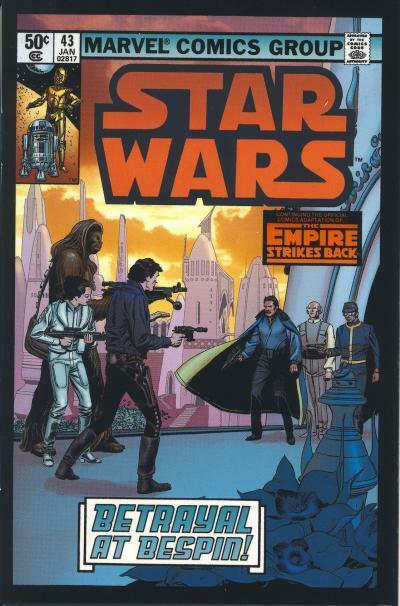 The comic uses the color blue throughout all the pages, including the non-Star Wars stories. 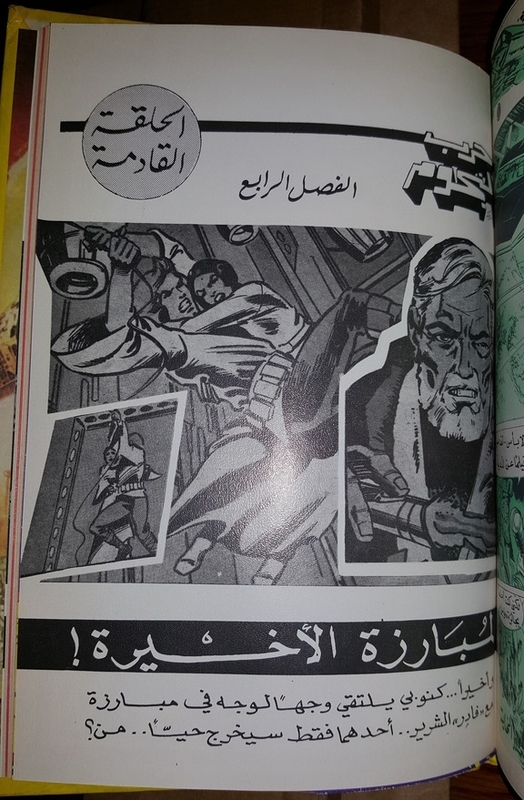 Bound issue #12 contains the Arabic translation of Star Wars #2. 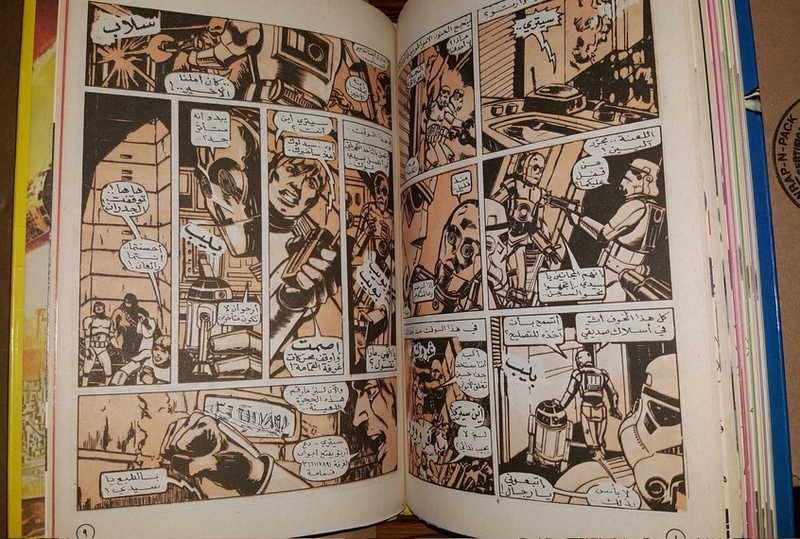 The comic uses the color red throughout all the pages, including the non-Star Wars stories. 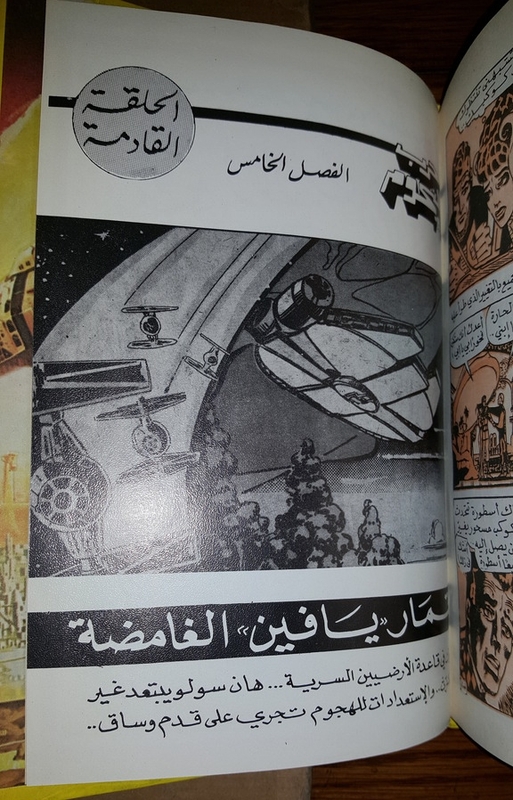 Bound issue #13 contains the Arabic translation of Star Wars #3. 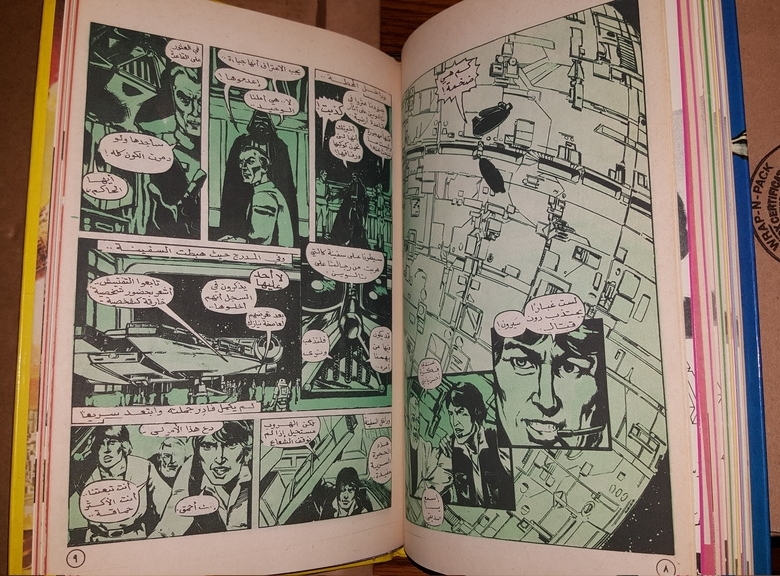 The comic uses the color green throughout all the pages, including the non-Star Wars stories. 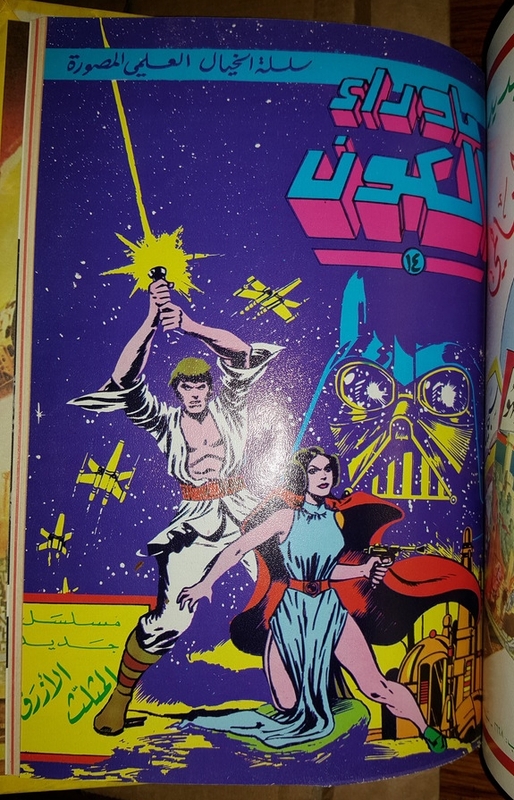 Bound issue #14 contains the Arabic translation of Star Wars #4. 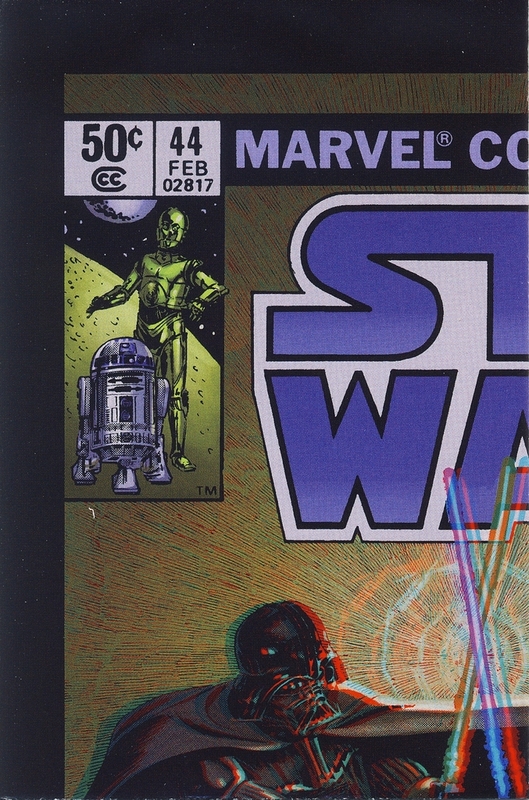 The comic uses the color red throughout all the pages, including the non-Star Wars stories. 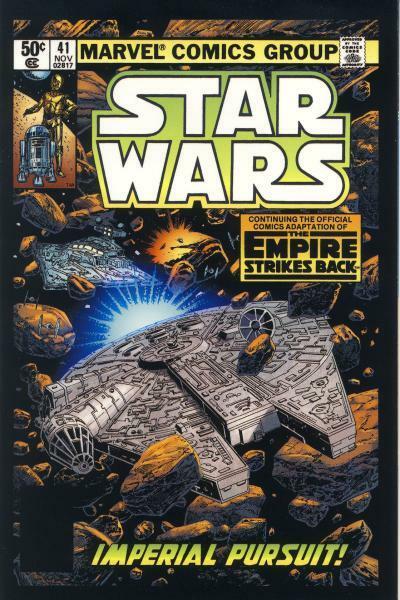 As can be seen, issue #11 contains the cover from Star Wars #1. 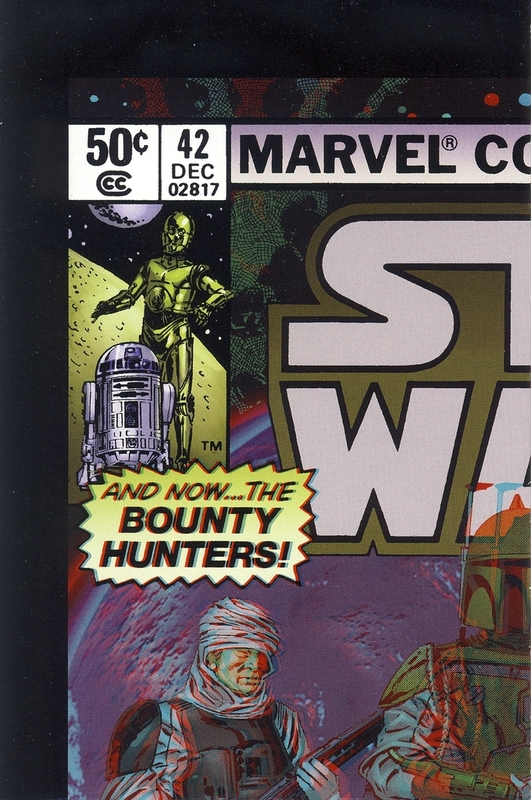 Issue #14 contains the cover from the treasury-sized Marvel Special Edition Featuring Star Wars #1. 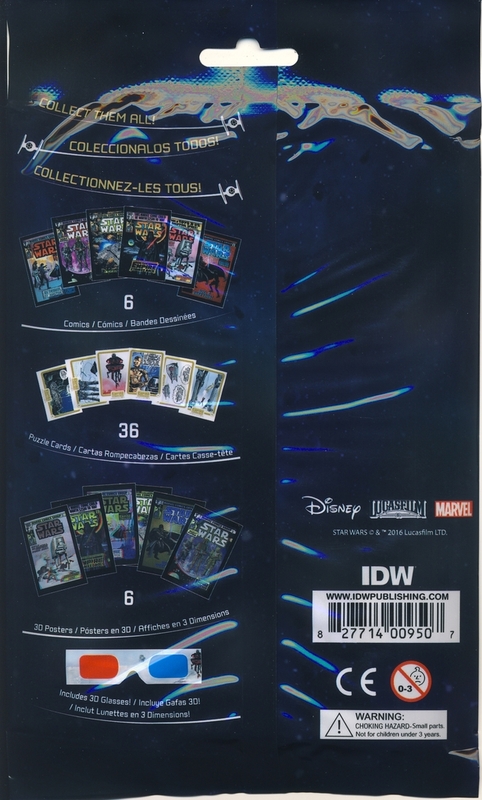 Despite not having Star Wars covers, issues #12 and 13 do contain small boxes with images denoting the Star Wars content.